This morning dawned cold and overcast so our decision to leave our fantastic location at Ardales seemed to have been the right one. 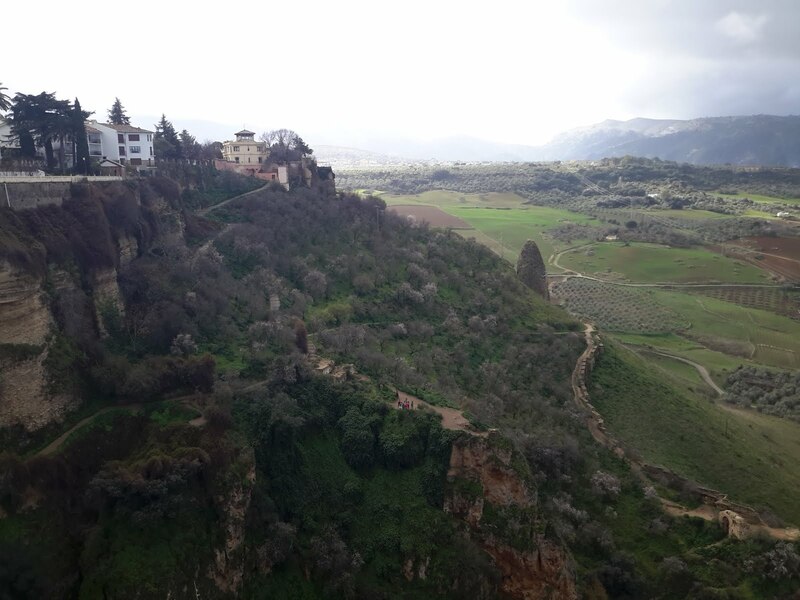 We pointed the T4rdis towards Ronda, and as our journey was only about 60kms, it didn't take long to get there, but on the way we did stop off for a bit of essential restocking at Aldi (thought we'd have a change from Lidl!). Then it was on to Camping El Sur which is about 1.5kms outside Ronda itself, so within easy walking distance for tomorrow. The camp site was almost empty (but our most expensive so far at 24.50 euros a night), so we had our pick of most pitches, but even so we ended up on a 'wonk' and needed to use the levelling ramps so that the gravy wouldn't slide off our plates at dinner time! Anyway, we soon got settled, did the washing, and after our exertions of the last few days, we put our feet up and had an easy afternoon! Boy did it rain overnight! I woke about 2am to hear it pounding on the T4rdis's roof and it continued with such a clatter that there was little chance of much more sleep! I passed the time with a game of scrabble, I read a bit, and eventually I dozed a bit, but still morning was a very long time coming! And then when John woke up he said he hadn't slept either - it's funny how well he snores in when he's awake! Having said that, we can't really complain; this is the first real rain we've seen heard since we've been in Spain (beginning of December), and even before that, while we were in France we saw very little of the wet stuff! Anyway, by the time we'd had a lazy get up and dawdled over breakfast it'd stopped, and although there were still a lot of heavy clouds about it managed not to rain again all day - and we were even lucky enough to get a few glimmers of sunshine as the day wore on. As planned, we walked into the historic mountaintop city of Ronda which is located above and on each side of the deep El Tajo gorge through which the River Guadalevin flows. We were greeted with dramatic views of the Serrania de Ronda mountains as we stood on the 'Puente Nuevo' - the new bridge that straddles the 100m chasm, and that dates back to the 18th century! The gorge separates the old town from the new, but it's within the new part that the legendary 18th century bullring is located in the Plaza de Toros. Apparently, the Ronda Bullring is recognised as the first 'purpose built' space for fighting bulls in the world, and it is also considered to be one of the most picturesque - but we didn't go in because just as we arrived several huge bus fulls of 'foreign' people also descended and jostled for position to take pics with their selfie sticks! Instead, we continued to meander along a walkway that follows the edge of the dramatic escarpment until we came to a balcony that overlooked part of the gorge - you can just about see it on the left of the first picture, and while we were there we paused to listen to a busker playing Spanish music on his accordion - he was really very good! The path then led us into an arboretum area called 'Alameda Del Tajo. Apparently, the park was first created at the end of the 18th century as a tree lined promenade from where the surrounding views could be admired, and today the numerous balconies still exist above the gorge. The blue blob is John! By now we were starting to feel quite peckish so it was time to seek out a watering hole - of which there were many! And then we continued to explore a little more of the old town. 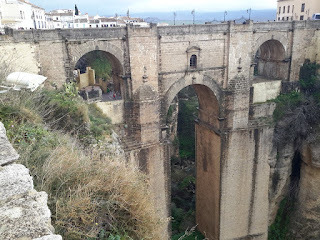 Besides the 'new bridge' Puente Nuevo (which was built between 1751 and 1793), there are also 2 others Puente Romano and Puente Viejo - the old bridges. The latter 2 are much smaller, and down a cobbled historic walkway where you can also find museums, gardens and the start of some long distance walking paths. However, museums aren't really our thing, and although we'd enjoyed wandering around this beautiful old part of town, rather than go into one of them, we both agreed it was time to head back to the T4rdis for a very welcome cuppa. This morning were going to move on again - probably to the Aire at Sanlucar de Barrameda, so depending on if we have internet, you may not hear from us again for a while!